Chocolate is never good for a cat (or dog) to eat. However, dark chocolate is far more dangerous because of its high levels of methylxanthines. Wrapping and ribbon can be extremely dangerous for your cat. If ingested, it can cause a cat's intestines to bunch and get twisted, and in many cases this will need to be remedied with surgery. If left untreated, this can be fatal. Low-hanging ornaments on a tree are just begging to be swatted at and then played with on the floor. Ingestion of ornaments can cause gastrointestinal blockage or rupture. Depending on what materials were used to make the ornament, toxicity may result if ingested. Christmas lights on a tree and elsewhere in the home can pose a hazard to cats. Chewing cords and lights can cause electric shocks and burns to the mouth. If your cat is reluctant to eat, drooling or showing signs of a painful mouth (i.e., not wanting to play with regular toys) be sure to rule out electric burns, dental issues and other diseases. Check power cords regularly for signs of chewing and general wear and tear. Mistletoe can cause significant vomiting and diarrhea, difficulty breathing, collapse, erratic behavior, hallucinations and death when ingested. A call to your veterinarian or poison control center should be immediately made for specific advice. Pine tree needles can produce drooling, oral irritation, vomiting, diarrhea, lethargy, trembling and posterior weakness. Tree needles are not easily digested; possibly causing GI irritation, vomiting, gastrointestinal obstruction or puncture. Artificial trees are also dangerous when ingested as the artificial material is not digestible and can cause intestinal obstruction. Christmas Tree Water may also have harmful or deadly consequences for cats and dogs (and children) who drink the water! Preservatives, pesticides, fertilizers and other agents, such as aspirin, are commonly used in the Christmas tree water to keep the tree fresh. Lilies and Daffodils - As little as a single leaf from any lily variety is lethal to cats. The plant bulb kits featuring Amaryllis and other plants in the lily family, Narcissus and other plants in the daffodil family, are popular gift items at Christmas time and these are very toxic for cats. If ingested, the cat may show severe symptoms of gastrointestinal signs, cardiac arrhythmias, kidney failure, convulsions and death. Daffodils are toxic to both dogs and cats, especially the bulbs. Holly, commonly found during the Christmas season, can cause intense vomiting, diarrhea and depression. Considered to be moderately to severely toxic and the veterinarian or poision control center should immediately be contacted for specific advice. Click here to view the entire ASPCA list of Toxic Plants for cats. Tinsel (just like ribbon) is almost irresistible to cats and, if ingested, it can require surgery to extract. Your cat probably isn't going to be too intrigued by the candle itself, but a swishing tail can easily knock a candle over, causing a host of problems. Keep candles out of reach, and make sure you stay vigilant around lit candles. I know it is tempting to give your cat just a nibble of turkey or other food during the holiday, but resist the urge. Rich foods can upset a cat's digestive system, which could produce unpleasant effects. Also, cats should never be given any type of bone, as they can splinter and cause internal injuries to your cat. Cats like routine and predictability, so when their schedules or environments change, they can become upset. If you are planning on having holiday guests and your cat isn't used to entertaining, create a safe, quiet space away from the action where your cat can have some peace and quiet. Have food, water and a litter box available to your cat in a secluded area so your cat can be comfortable away from your gathering." 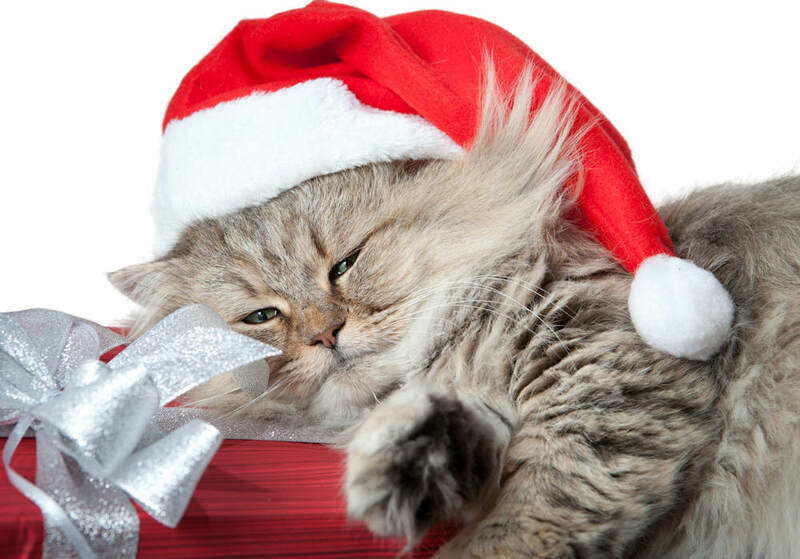 If the stress of the holidays does become too much for your cat to handle, try synthetic pheromones, such as Feliway. I have more than one Feliway diffuser around the house. Click here to purchase Feliway on Amazon. Every companion animal deserves a home where it will be wanted and well taken care of. Shelters nationwide report an increase in new arrivals right after the holidays, when people surrender the "gift pet" that they may not have wanted. Please do not give a cat to someone as a gift. If you are traveling with your cat during the holidays, be sure that your cat is properly secured in a carrier and that it has adequate identification, including a microchip. That way, if you get separated, your cat has a way to be reunited with you. Also, prior to leaving home, find contact information for a veterinarian or an emergency veterinarian in the area you are visiting, so that, if your cat gets injured or becomes ill, you know where to go to get your cat the care and attention it requires. If you have festive plants, make sure they are somewhere your cat won't be tempted to chew on them. If you are unsure if a plant is poisonous, or are concerned that your cat may have eaten something dangerous, call your veterinarian or the ASPCA's animal poison control center (888-426-4435) for more information.